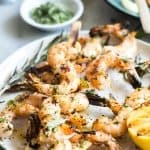 This grilled shrimp recipe is packed with flavor after marinating in fresh herbs, shallot and Pernod overnight. Fill up some skewers and fire up the grill for a simple summer appetizer. To say I grill a lot in the summer might be an understatement. 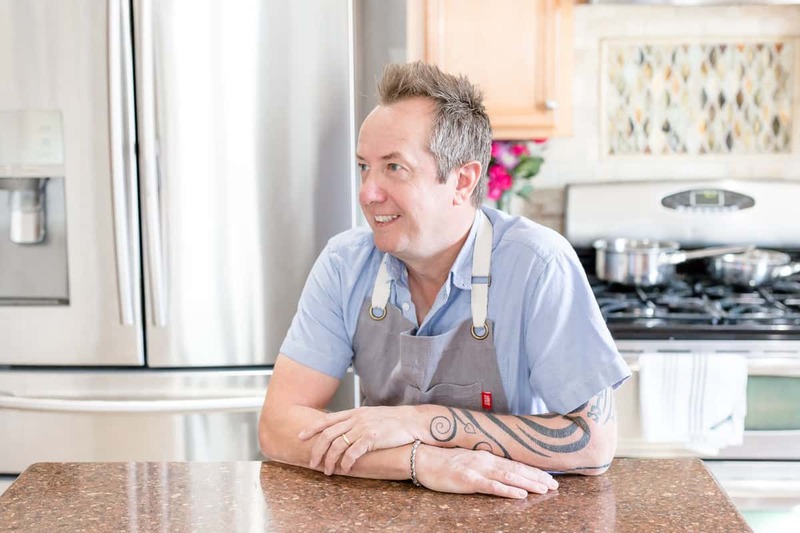 I love to get out of the confinement of the kitchen and feel the heat and smoke from the grill. Anything I do grill is usually ready to eat in less than 10 minutes unless it’s something from my smoker which can take anywhere between 10-12 hours. The fast cook doesn’t mean that the food is lacking in love. It just means that the love went into it at a different point of time. I say love a lot, because I think I really actually do love my food. These jumbo shrimp are a perfect example of that. They cook in about 6-8 minutes but they marinate in a mixture of shallots, fresh mixed herbs, lemon juice and Pernod Classic overnight. As an ambassador for Pernod Classic, you’ll see some more recipes coming up through the weeks with this appetizer followed by a main course, side dish and a dessert all including Pernod somewhere in the recipe. I’ll also be making cocktails. If you are familiar with the flavor, you’ll know I need to do some serious thinking about this because Pernod has a really unique fennel and anise flavor to it. I’m excited about all of the recipe challenges but I can’t wait for dessert! I used a mixture of marjoram, rosemary and thyme to mix in with the marinade. The flavors go really well with the Pernod and don’t worry about the alcohol, it burns off during cooking. 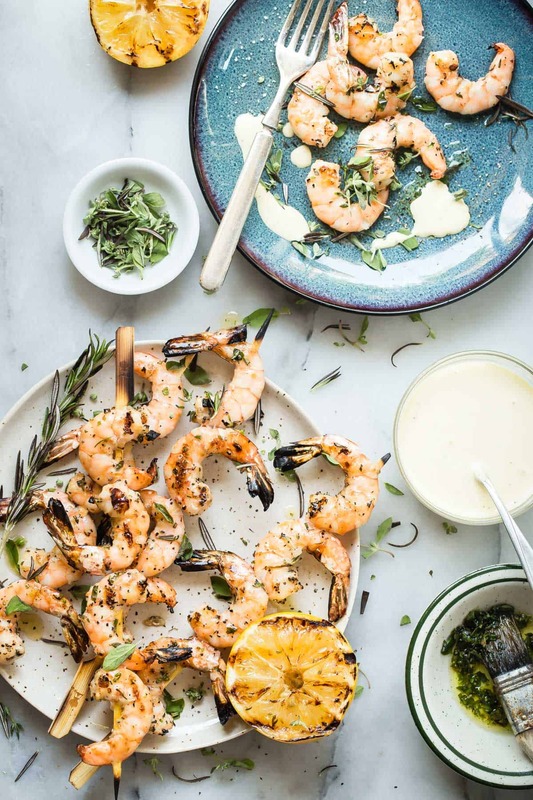 Finish these shrimp with a splash of good extra virgin olive oil and lemon aioli for dipping. This is a summer backyard grilling recipe that everyone’s going to ask you to make all the time. 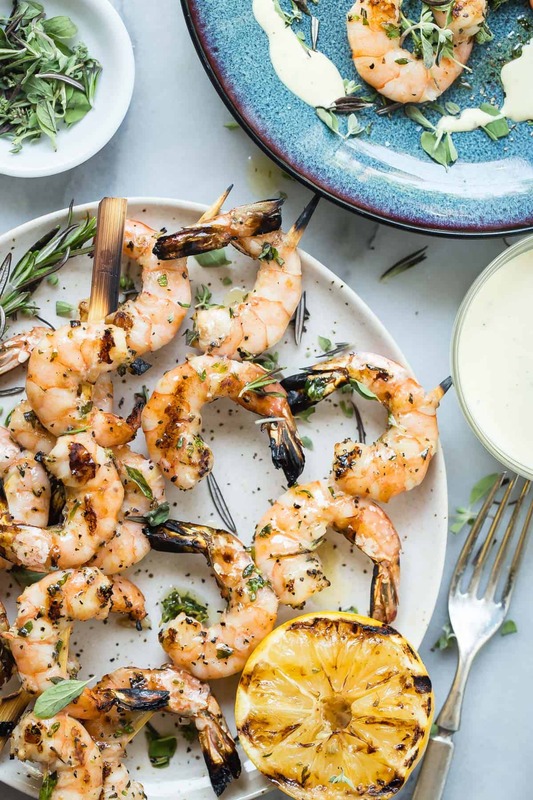 Now you have these awesome shrimp appetizers to chow down on, but you’re also going to need something to drink. Pernod and water over ice was made for this appetizer. It’s light and refreshing and doesn’t mess with the flavor of the shrimp. 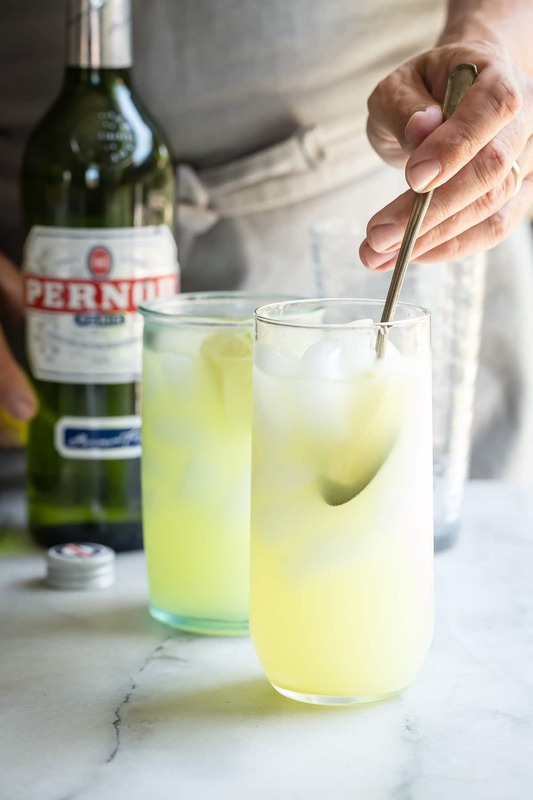 Summer is here and we’re celebrating Pernod style over here! 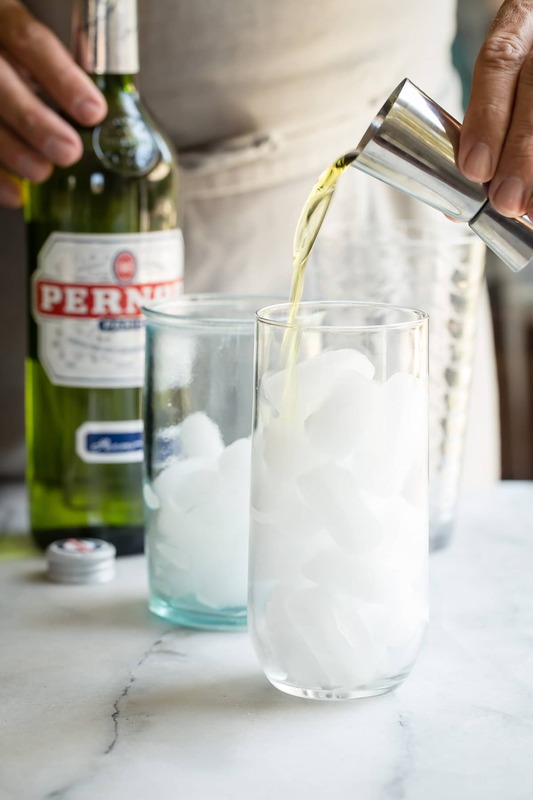 This is a sponsored post in connection with Pernod Classic. All thoughts and opinions are always my own. 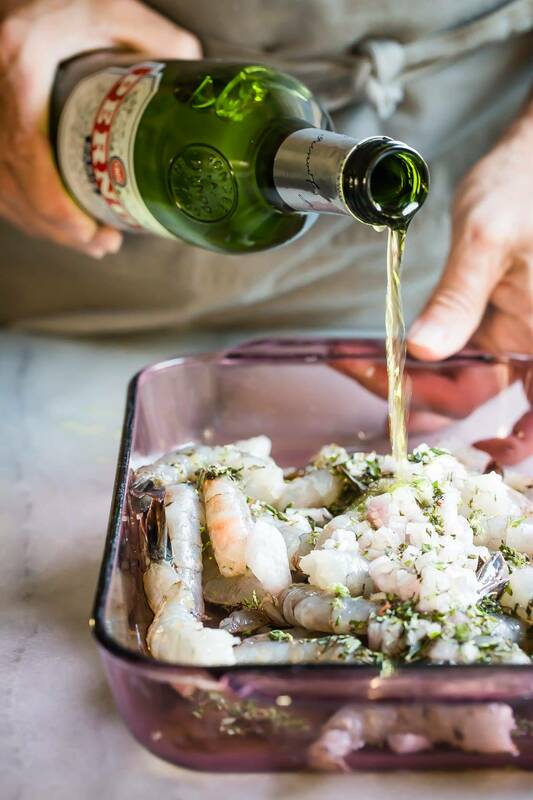 In a large flat baking dish, combine the shrimp, shallot, fresh herbs, lemon juice, olive oil and Pernod. Leave for at least 3 hours or overnight to marinade. In a blender mix the egg yolks, mustard, garlic, salt, pepper and lemon juice. Slowly pour in the olive and canola oils until the mixture is thick and creamy. Keep refrigerated. 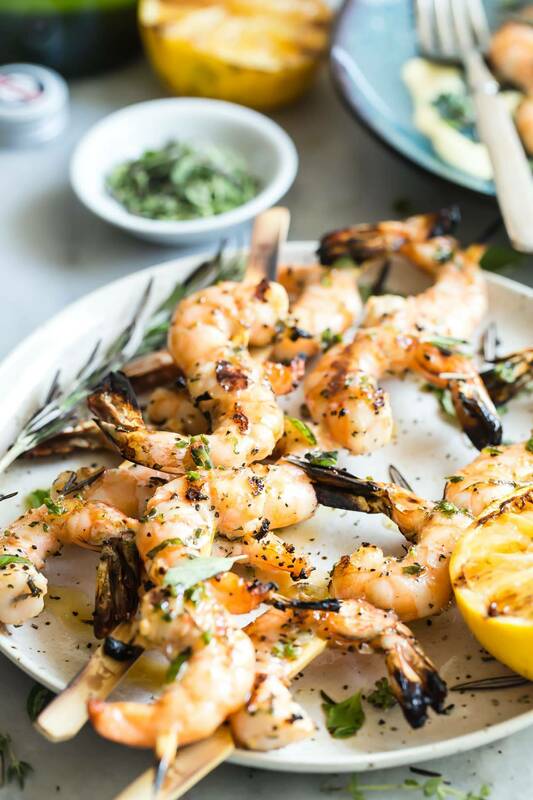 Thread the shrimp onto wooden skewers and place onto the hot grill. Grill for about 2 minutes and then turn the skewers over, cook for a further two minutes and they become nice and pink. Garnish with extra olive oil and fresh herbs and serve at once with the lemon aioli dip. To make the cocktail, fill a highball glass with ice. Pour in 1 part Pernod. Add 5 parts cold water and gently mix. I’ve got a bottle of Pernod in my pantry just waiting for this recipe!! Never thought to use it in a marinade, but it makes perfect sense. 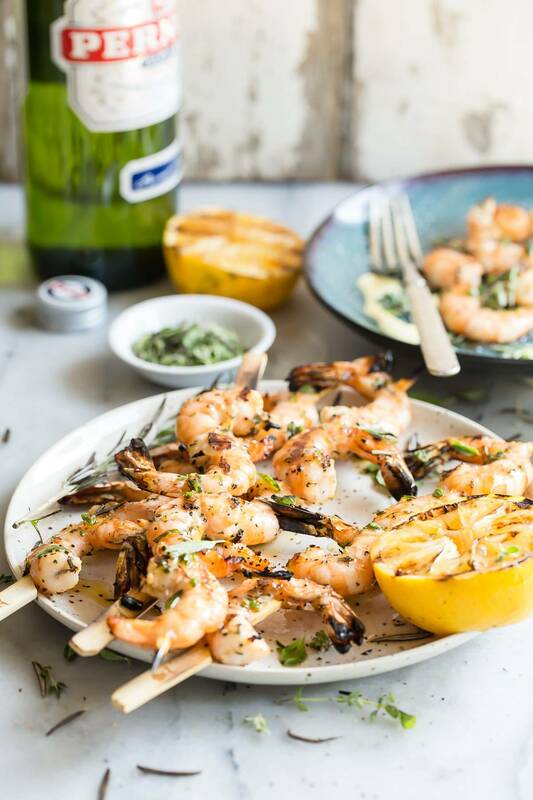 Shrimp skewers are my fave and your marinade is just what I need to switch up my routine. Love this recipe! I need to bust out my grill more because these look dynamite!